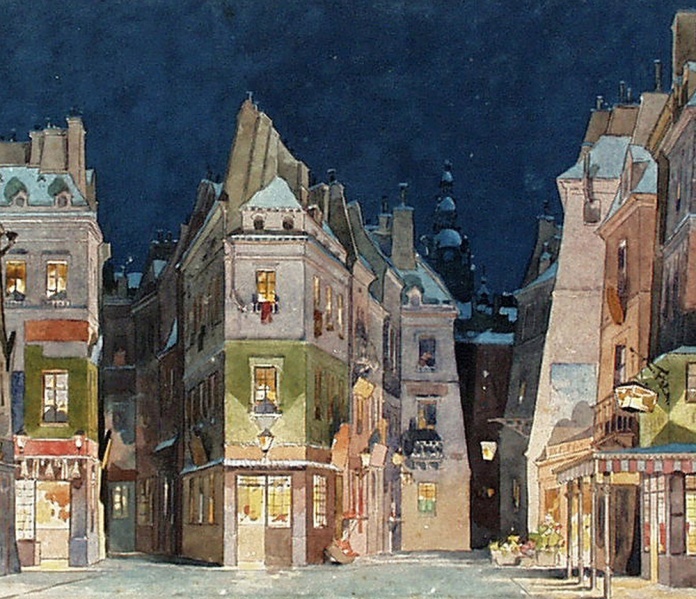 A Paris street – set design for Act II of Puccini’s La bohème by Adolfo Hohenstein. One of the funniest episodes in the historiography of bohemianism is the first appearance of the term bohemian in relation to artistic endeavor. The year is 1834 and Félix Pyat, a French journalist of communard persuasion, publishes a well-written article called “Les Artistes” in which he derogatorily describes wannabe artists as “alien and bizarre … outside the law, beyond the reaches of society … they are the Bohemians of today” (tr. Levi Asher). Félix Pyat connects ‘one who lives like a Bohemian’, meaning like a vagabond, with artists and he calls the latter “les Bohémiens d’aujourd’hui” (the Bohemians of today). The term Bohemianism, meant as a slur by Pyat, was later reappropriated by the artistic community. The illustration above by Adolfo Hohenstein is extremely picturesque and immediately recognizable as a French or Parisian street. This entry was posted in Uncategorized and tagged 19th century, art, art for art's sake, artist, artistism, Bohemianism, Paris, subculture on December 27, 2013 by jahsonic.